Josephus Wars 3 3 1: "...as far as Bersabe, from which beginning also is taken the breadth of the Upper Galilee"
Beer Sheba (of the Galilee) was one of the sites that were fortified by Josephus Flavius in the Jewish revolt against the Romans. 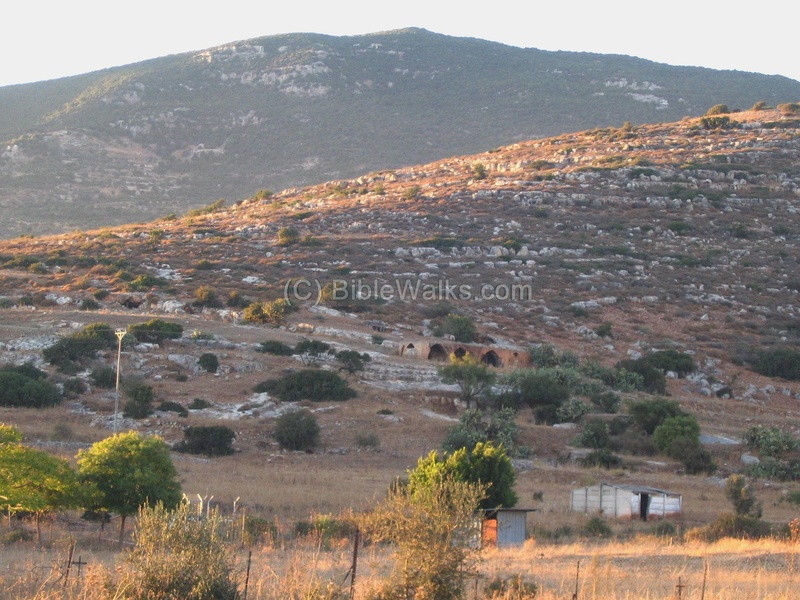 It is located on the boundary between the lower and upper Galilee, and close to ancient roads. The ruins of the city are located on a steep hill (472M) above the ancient west-east road that connected Acre to the Sea of Galilee , today the modern highway #85. 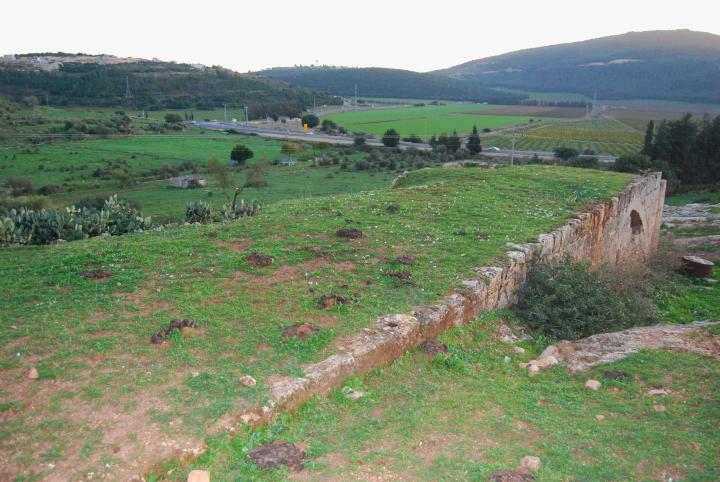 The site is just on the border of the lower (southern) Galilee and the upper (northern) Galilee. It is also located between two sections of the Zalmon creek, which flows from the hills of the upper Galilee, down to the the sea of Galilee. The aerial map below shows the major points of interest, with an orientation to the east. Pointing and clicking on selected points in purple will automatically scroll to the relevant photo or site. 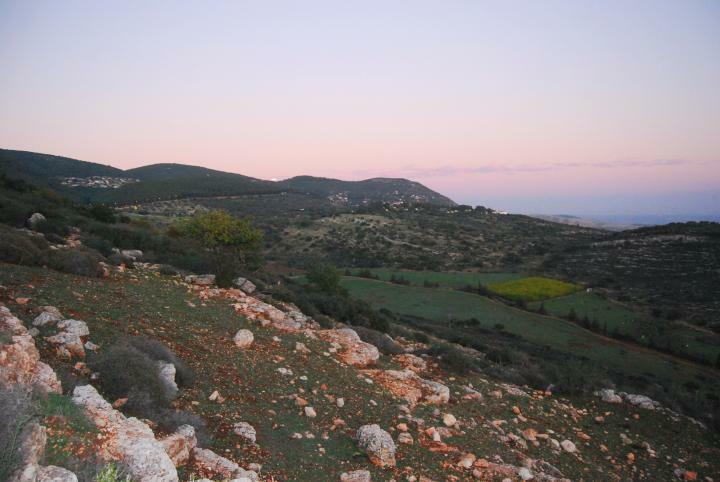 "...as far as Bersabe, from which beginning also is taken the breadth of the Upper Galilee". Its fate at that campaign is not known. 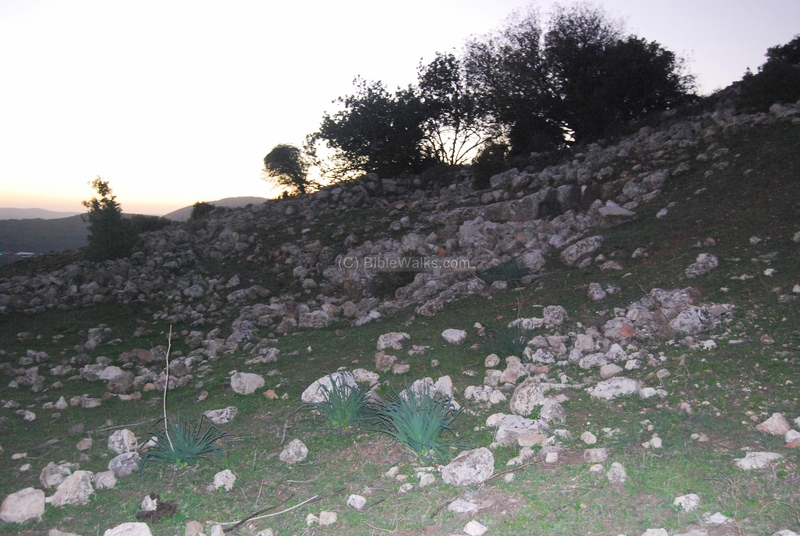 According to the excavators (Aviam 1985; Tal, Pepper and Fantalkin - 2000) the line of wall surrounds the upper third of the hill, occupying 60-70 Dunams (6-7 hectares) . Its northern side is about 2.8M wide, with three semi-circular towers on its north-east side. Its eastern side is based on a saw-tooth shaped. A number of structures and cisterns are on the top of the hill. The pottery was Hellenistic and Early Roman. These findings supports Josephus accounts of his fortifications of Beer Sheba of the Galilee. According to Leibner (2004) the town continued to be populated until the 3rd Century AD, but the population declined after the 1st century. 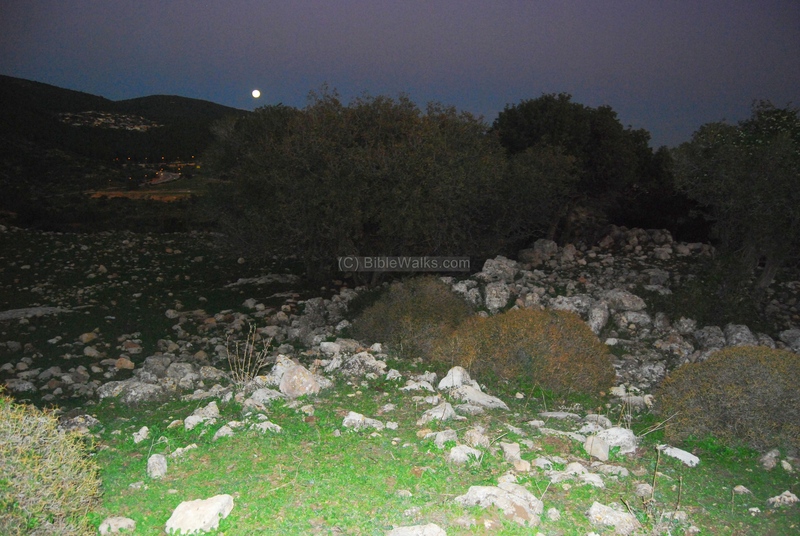 After then, the population moved to the new nearby sites - Kefar Hannania and Parod. These Roman/Byzantine villages were probably satellites of the fortress, and after the great revolt the population shifted to these larger and more accessible sites, while the fortress was abandoned. Conder and Kitchener surveyed this area during the Survey of Western Palestine (SWP), commissioned by the Palestine Exploration Fund (PEF) in 1873. 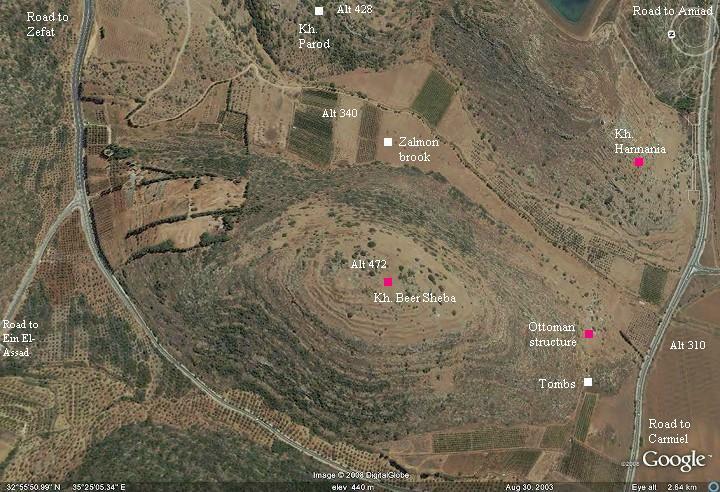 A section of their survey map also shows the site in its center two villages that were founded during the Roman period: Kefar Hannania (Kefr Anan) and Parod (Ferradieh). "Kh. 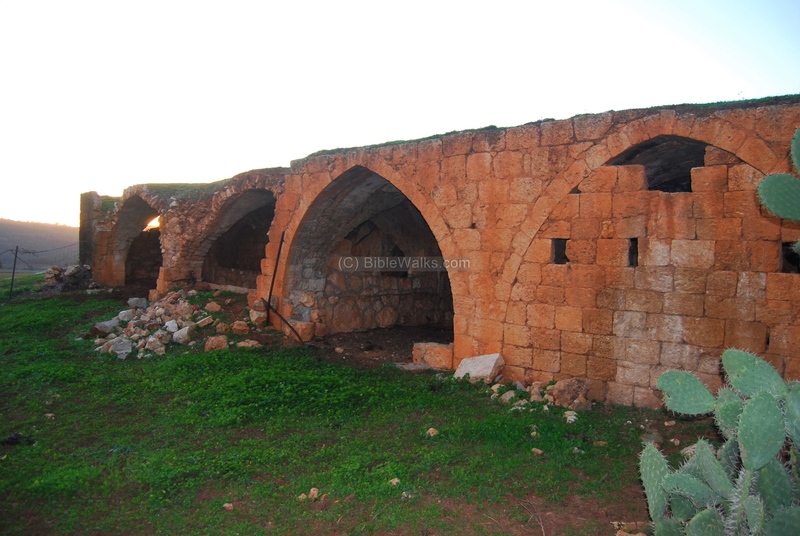 Abu esh Sheba - A large ruin, which stands upon the terraced hill- top". The Arabic name of the site means according to the SWP dictionary: "The ruin with the chickweed". Actually, it resembles the ancient Hebrew name - Beer Sheba ("seven wells") and was one of the factors that support the identification of the ruin. The site is open to the public, although the steep hill is accessed only by walking paths from all sides. This photo, captured by a drone, shows the summit and foothills of Khirbet Beer Sheba from the south side (near highway #85). The Zalmon creek is in the center, 130m below the height of the summit. This steep descent gave the hill a great natural defense, which is why Josephus fortified the village during the great revolt. The hills is the background are in the Upper Galilee region, while the foreground is part of the Lower Galilee. Another view, captured by a drone from the west side of the steep hill, is in the next photo. Notice the traces of fortification walls on the upper third of the hill. 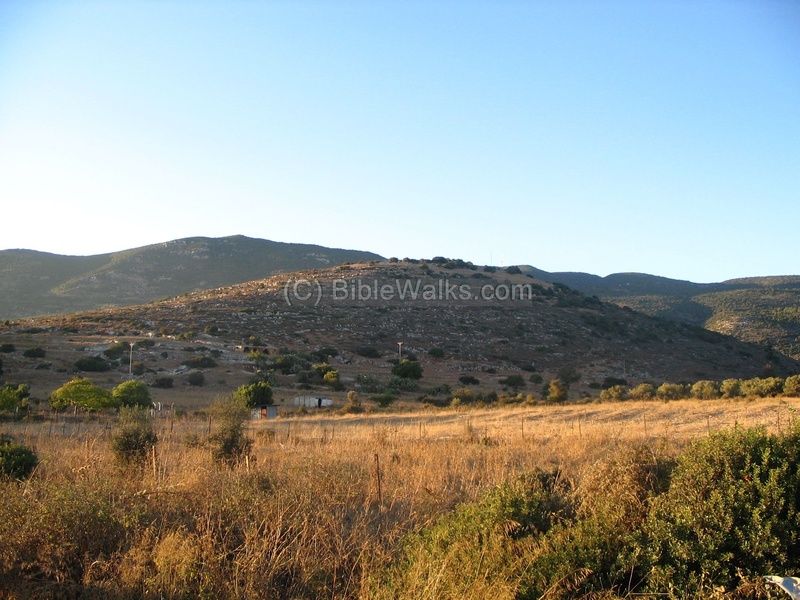 The following photo is a view from the main road from Karmiel to the sea of Galilee, looking towards the north (the hills of the upper Galilee). The ancient fortified city is on top of the hill. On top of the hill there are traces of ruins of the Roman city - the foundations of the houses and walls that were fortified by Josephus. The walls occupy the top third of the hill, while the structures are mostly located on the top side. The north side of the summit is seen in this drone view. The northern wall is about 2.8M wide, with three semi-circular towers on its east side. 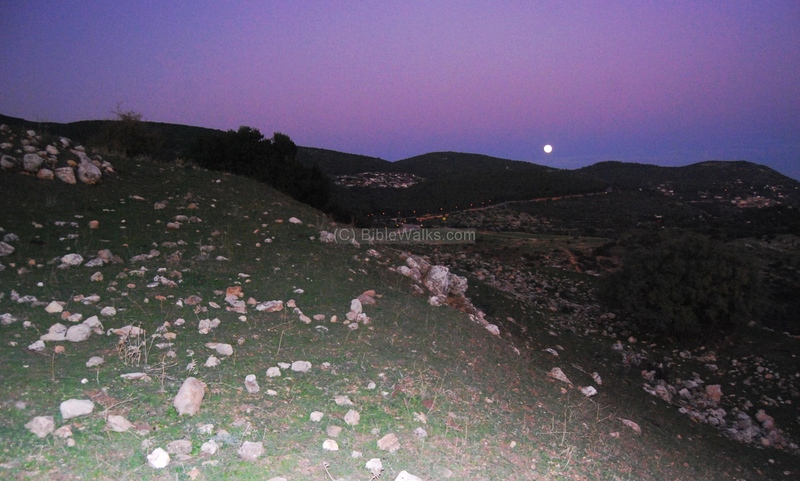 The following photos were taken during dusk, when the moon was rising over the eastern hills. 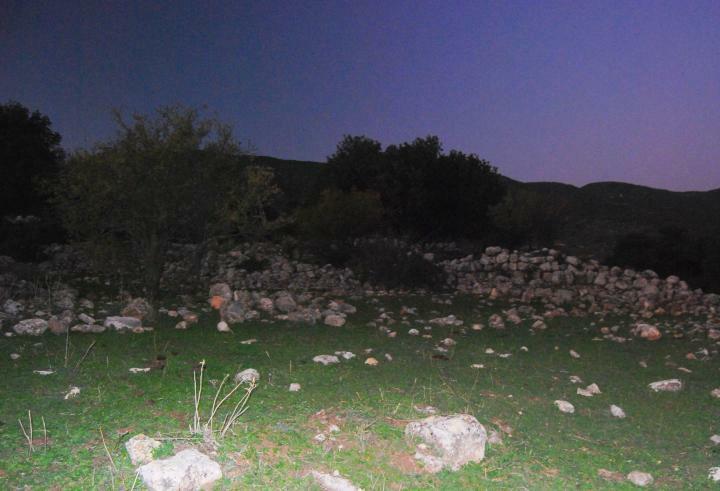 The moon appeared over Israel on 12/12/2008 at its largest size and brightest glow in 15 years, and was casting a magical scene. The photo below shows a view from the foothills towards the valley of Zalmon. On the other side of the valley are other ancient Roman/Byzantine site - Farod/Parod (center background) and Kefar-Hannania (hidden right). 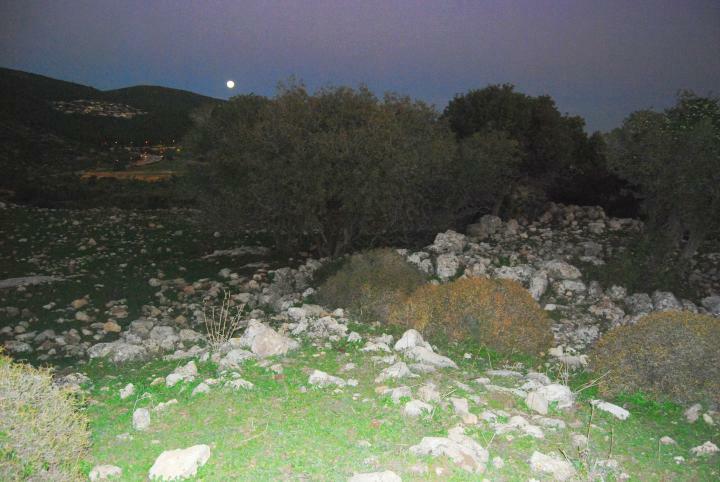 The moon is just rising over the hills of Zefat. The ruins of the fortifications are seen in this view of the eastern foothills. 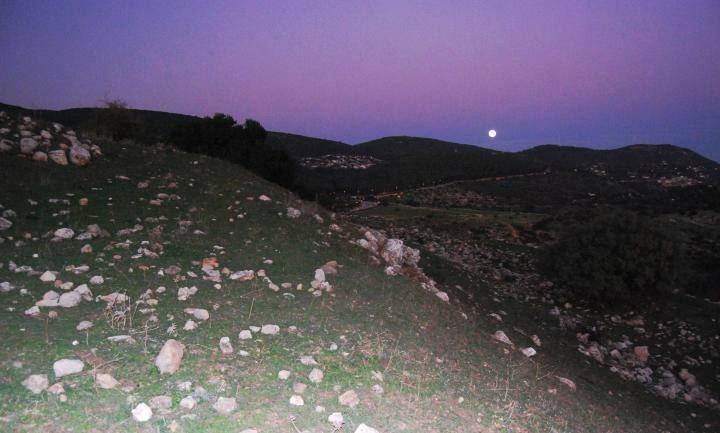 Two modern settlements are seen in the background - Moshav Shefer on the left of the moon and Kibbutz Parod (Farod) on its right. The top of the hill is scattered with traces of walls. These are the structures dated to the great revolt against the Romans, and were in use until the 3rd C AD. More scenes of the ruins on top of the hill. View of the ruins on the south eastern foothill. A closer view of the site is in this photo. You can notice at the bottom of the hill there are ruins of a large Arabic structure. Around it there are many caves from the Roman period. A closer view of the arched structure is seen below. Under the arches are rock-hewn cavities, which may have been used to hold hay and water as part of a horse stable. 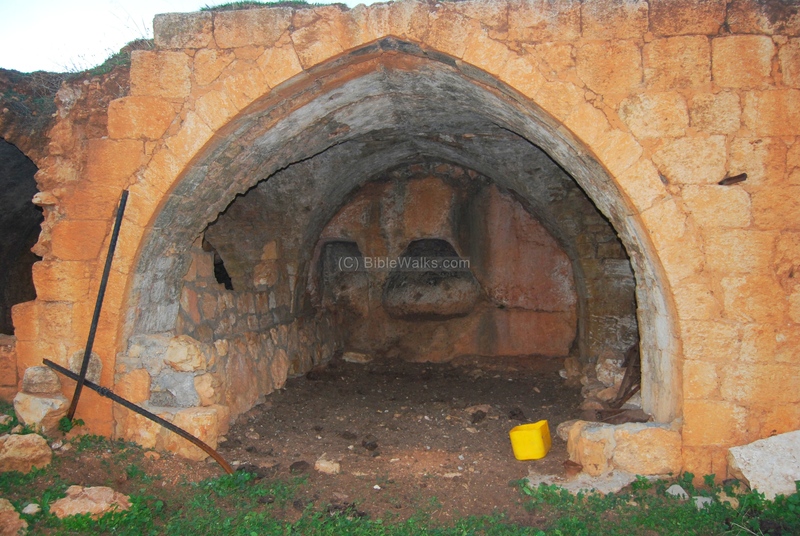 The photo below shows the roof of the structure. In the background is the valley of Zalmon, Givat Hannania and the modern road from Karmiel to Amiad. In order to get there, you can drive from Acre or Karmiel towards east, and stop at the Hannania junction or in its vicinity. The ancient site is at the top of the steep hill, and so it will be easier to approach it from the upper side of the road that climbs up to Zephat. Josephus was the Commander of the Jewish revolt against the Romans, and later a historian of the period. He writes that he fortified the city (Bersabee). Note that Selamis is the ancient village 5 KM down the Tsalmon creek, and Jotapata is Yodfat. "Josephus ... knew the Romans would fall upon Galilee, he built walls in proper places about Jotapata, and Bersabee, and Selamis; ...".
" Now Phoenicia and Syria encompass about the Galilees, which are two, and called the Upper Galilee and the Lower. They are bounded toward the sun-setting, with the borders of the territory belonging to Ptolemais, and by Carmel; which mountain had formerly belonged to the Galileans, but now belonged to the Tyrians; to which mountain adjoins Gaba, which is called the City of Horsemen, because those horsemen that were dismissed by Herod the king dwelt therein; they are bounded on the south with Samaria and Scythopolis, as far as the river Jordan; on the east with Hippeae and Gadaris, and also with Ganlonitis, and the borders of the kingdom of Agrippa; its northern parts are hounded by Tyre, and the country of the Tyrians. As for that Galilee which is called the Lower, it, extends in length from Tiberias to Zabulon, and of the maritime places Ptolemais is its neighbor; its breadth is from the village called Xaloth, which lies in the great plain, as far as Bersabe, from which beginning also is taken the breadth of the Upper Galilee, as far as the village Baca, which divides the land of the Tyrians from it; its length is also from Meloth to Thella, a village near to Jordan". Beer Sheba - the seven wells (in Hebrew). It is the same name as the large city in the south of Israel, but there is no connection between them. BerSabee, BerSabe - the name of the fortress in Josephus' history book. Hannania - in Hebrew: "God (-ia) has pardoned (Hannan-).